This averaged size, size 3 potjie with a 7.8 litre capacity is perfect for cooking for 4-6 people. 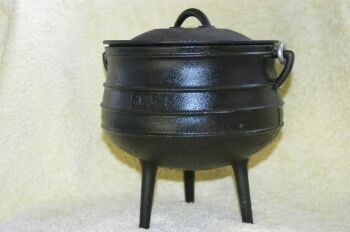 A traditional South African cast iron cooking pot, on three legs so can be easily placed over a fire. Due to its shape and material potjie’s are an easy and energy efficient way of cooking. Cooking potjiekos is a great way to socialise and relax with friends and family. Make sure you potjie is ‘cooked in’ before using and is cleaned and stored correctly after use. This will keep adding great flavour to your potjiekos and with correct care will last generations.